Nairobi sources reported that US First Lady Melania Trump visited Kenya on Friday, on her third leg of a solo tour of Africa. Meanwhile feeding elephants at the David Sheldrick Wildlife Trust in Nairobi, one of calves moved suddenly advancing towards her causing the former model to lose footing. Accordingly she chuckled and brushed aside the incident. She was feeding the animals and gave a baby elephant a bottled formula. 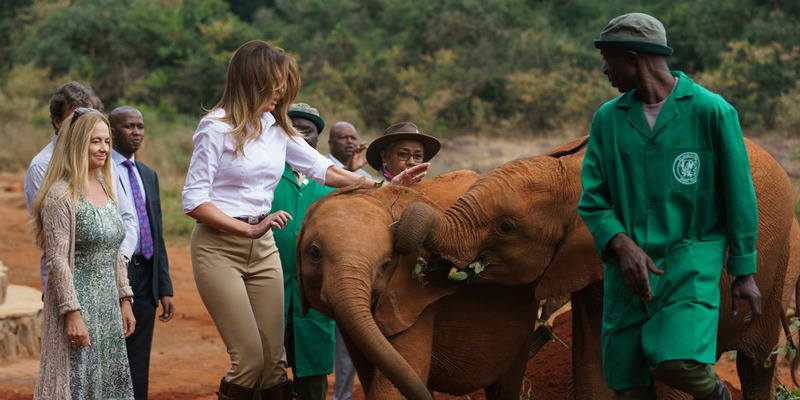 She was dressed in a white shirt and beige pants and the US first lady was all smiles for the camera while at the Wildlife Trust, famed for its work rescuing the orphans from the wild. Meanwhile Ms Trump then took to the Nairobi National Park and will later visit an orphanage and watch a play. Moreover Melania Trump, who is in Africa to promote her children's welfare program, began her trip in Ghana, where she visited mothers and their newborns. Accordingly the First Lady's visit comes during a tumultuous time in Washington when the Trump administration is dealing with sexual assault allegations against Brett Kavanaugh, Donald Trump's Supreme Court pick. Earlier Donald Trump had in an infamous comment referred to African nations as "shithole countries. Earlier, when Ms Trump landed in Malawi, she was greeted with "Not a Shithole" signs.